Story: Paul Johnstone grew up with his mother in Harlem after his father died. After Paul had been caught stealing he was under the supervision of a man named Richard Woodroe who had been assigned to the case. Woodroe took an interest in Paul and helped him and became a surrogate father . Paul became a lawyer  and ended up as D.A. The details have not been revealed but Paul turned down a request from a criminal and to make an example of him the crooks attacked him and injected him with HIV-infected blood . The possibility of Johnstone having AIDS made his co-workers fear for their safety and in frustration of the bigotry he experienced he punched a co-worker. For this he lost his job and ended up in jail and only got out learn that he was HIV positive . While sitting at the hospital feeling sorry for himself, his friend Christina Ried came by. She had been working on an exoskeleton and suggested that he became a knight in shining armor who took back the city from the criminals . Christina trained Johnston in how to fight and do the most physical damage, and gave him the armor she and Carlton Sum had crated. Johnston took the name ShadowHawk after his favorite super-hero . When Johnstone started his activities he was mostly perceived as an urban legend. In the beginning he broke the spine of the criminals making them imprisoned in their own bodies. The criminals with the broken spines showed that something was loose, hunting the criminals but no one had really seen anything . 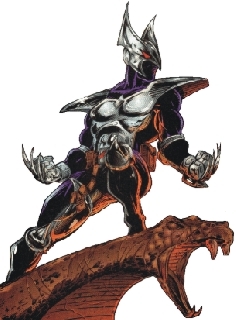 His activities as vigilante made him hunted by both the criminals and the law [5, 11] and reviving the name ShadowHawk brought out psychos like Hawks's Shadow . After the destruction of the second Brigade team, the man known as Troll was contacted by Seahawk, one of the survivors from the team. He wanted Troll to retrieve an ancient tome . The search for the book and the encounter with the cult brought him together with Vanguard and Wally, ShadowHawk, Glory, Roman and Tremor, ending in the formation of the third Brigade team . ShadowHawk only stayed with the team briefly as he started to get sick shortly after joining the team. The search for a cure took ShadowHawk many places but no one could help him. As he an Phoebe were searching for a cure, he started to get weak and sick . One of the cures he tried was getting a blood sample from Supreme. Instead of getting a blood sample he ended up fighting Supreme. In the fight he lost his helmet and it was revealed to the World, that Paul Johnstone was ShadowHawk . In the end he met Spawn who told him that there was nothing he could do, but death was not the end and he should learn from his experiences and face death like a man . Paul Johnstones career as ShadowHawk ended shortly after. Hawk's Shadow attacked Johnstone's mother during an interview and ShadowHawk stopped him. After the fight he was too weak to escape the police who had hunted him after his identity was revealed. He was taken to a hospital where he died . Equipment: ShadowHawk wore an armor with a grappling hook, claws and infra red sight. Besides the armor he also has a specially designed shuriken/boomerang.